Think of a subject that starts with either the letter “D” or “S”. Find it, and make a photo! For the sake of transparency, let’s be honest: sometimes homemade cleaning products don’t work super well. I’ve definitely tried recipes that were a total bust. That’s why, today, I’m going to share with you the proven, three-ingredient, all-purpose cleaner that my family has been using for years with great results. This recipe works in so many places. Use it to clean the stove, sink, countertops, floors, windows, and mirrors. Basically anywhere that you’d reach for a spray cleaner, this stuff works great. There is one case, though, where you should absolutely never use it. If you have granite countertops, please do not use this cleaner on them. In fact, even if your counters are not granite, if the manufacturer says not to use an acidic cleaner on them, this is not the recipe for you. If you’re not sure what kind of counters you have, do some google searching. You can also do a spot test. This cleaner will ruin real granite counters. The acidity will dull or even etch unsightly marks into your granite counters. You’ve been warned. For granite or other acid-hating surfaces, try this recipe instead. I haven’t used it personally, but I can tell you that the Dr. Bronner’s soap it uses is good stuff. Remember, even if you do have granite you can use this cleaner pretty much everywhere else. Just not on the counters. 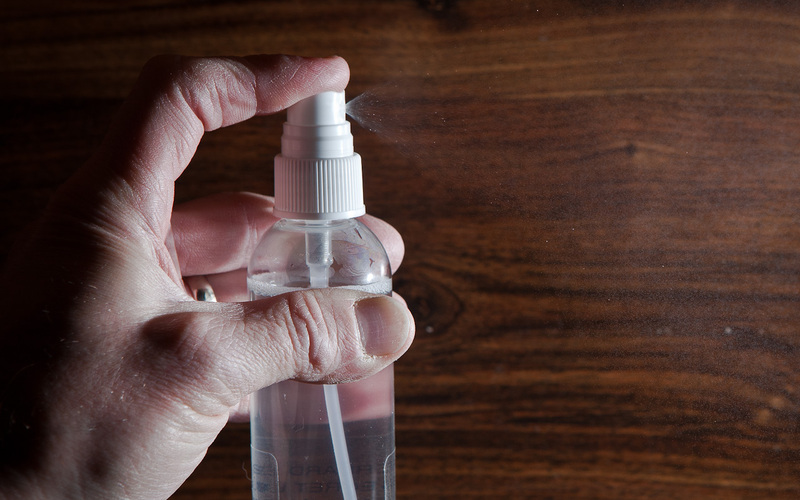 To make your cleaner, just fill a spray bottle halfway with vinegar, and then top it off with water. Add a few drops of essential oil. Close the bottle, shake, and give it a sniff. You can keep adding essential oil and shaking to mix until you get the scent you like. 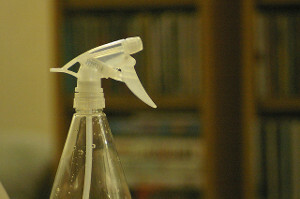 To use, just give the bottle a shake, and spray like you would store-bought all purpose cleaner. 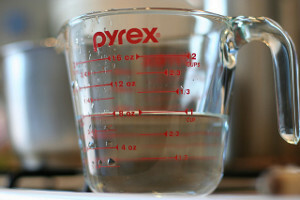 For stuck-on grime, like on a stovetop, let the cleaner sit for a minute or two to soften things up. This makes it a lot easier to wipe away gunk. This cleaner does leave a vinegar smell behind, but it fades within a few hours. If you’re cleaning for a party, I’d definitely plan to be done with this spray a few hours ahead of time if you think your guests would be turned off by a faint vinegar scent. Unfortunately, because most store-bought cleaners are packed with toxic chemical fragrance, we tend to associate their sickly, perfumy smell with clean, rather than the smell of something like vinegar, which actually does clean and disinfect. Ready to mix up a batch of all-purpose cleaner? Grab a new (or wash out an old) spray bottle, and go for it! If you want your mix to look totally professional, you can grab my free printable label to dress up the bottle. DIY natural cleaners are easy to make, and SO much cheaper and safer than their chemical-laden store-bought counterparts.